Natalie at Perry's Plate has the most beautiful blog and recipes. She also shares my love of wholesome fresh foods. I've found so many great recipes (from her blog) that my picky girls ate right up! We both have 2 young girls, and understand how frustrating it can be to have them try new healthy foods that they instantly refuse. I think you'll find Natalie has mastered this feat! My name is Natalie and you can find e blogging at Perry's Plate. I'm so excited to be guest posting on Katie's beautiful blog! Katie and I share a love of whole, clean food. I also try to cram as many vegetables as possible into every meal that I make. Like most kids, my two girls are carb fiends and would gladly live out their days munching on bread or noodles alone. Luckily I discovered techniques to play off of their fondness for pasta. You may have guessed that those "noodles" aren't really pasta, but thinly julienned zucchini. 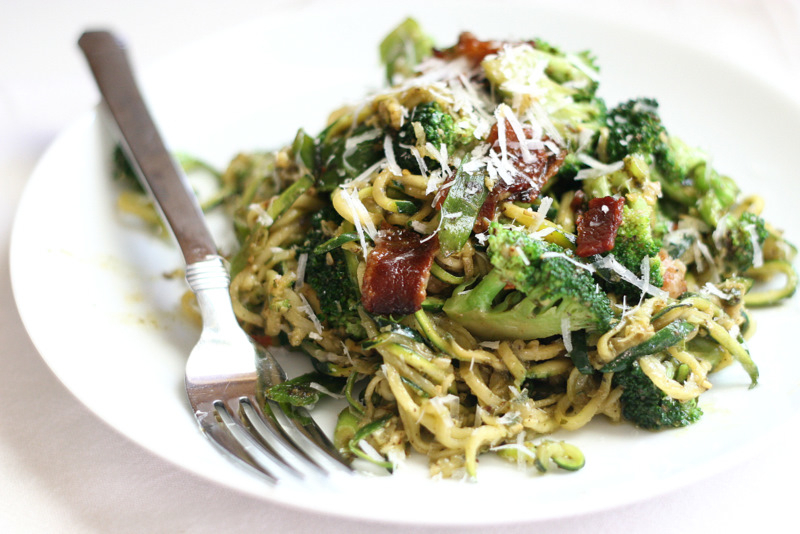 It's a great pasta alternative if you're eating paleo, gluten-free, or low carb. I feel like I'm the last one in the blogosphere to try out zucchini "noodles." I was surprised at how the texture and appearance of the zucchini resembled actual pasta. I think I even giggled a few times. My kids were hesitant (I'm still trying to get them to like zucchini. That night we made progress!) but I think after a few tries they'll be slurping up those "noodles" like nobody's business. Especially if it has bacon sprinkled in it. I really like bacon. (Evidence here and here.) Bacon is my insurance if I'm not sure if something will turn out well. And it's a small change to make a mostly-vegetable dish a little more indulgent. Throw a little bacon in and a mediocre dish will rise to "pretty good" status. Instantly. No, it's not the most healthful food, but I feel better about eating a little bacon once in a while than something artificial or processed beyond recognition. This sneaky "spaghetti" dish comes together quickly and easily! For more whole-food, family-friendly recipes come see me over at Perry's Plate. Thank you Katie, for letting me have your blog for the day! Meanwhile, cook bacon in a skillet over medium heat until crisp, turning frequently. Remove bacon to a stack of paper towels to drain. Crumble bacon. Remove all but 2 Tb of bacon drippings from the pan. Return the pan to medium heat. Add the green onions and broccoli, stirring frequently for about 3-5 minutes or until crisp-tender. Add zucchini and 2 Tb of pesto, tossing to combine all ingredients. Taste and add more pesto, if needed. The mixture only needs to warm-up so 2-3 minutes ought to do it. This just sounds absolutely delicious! Great guest post! This looks amazing! 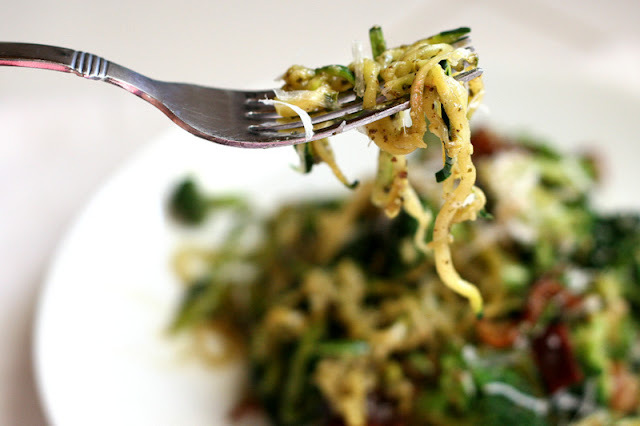 I love zucchini, so I really like the idea of using them in place of noodles! This looks incredible. and your pictures are fantastic. Love it all. What a terrific recipe and fabulous guest post! Your pictures are - as always - a feast for the eyes! Pesto and zucchini, two of my favorites all combined in to one delicious dish. Sounds delicious! Wonderful guest post! All right Natalie - you're not the last one on the blogosphere to try them, because I've never heard of them before! I think it looks crazy good, and bacon never hurts. HI!! Found your blog from Perry's Plate. Thanks so much! Looks wonderful!! I want to win the contest please... I liked you Facebook! I signed up for your blog... I want to win the anthropologie gifts please. I am vegan and I make this all the time. I put tofu in instead of the bacon (I cook it with pesto sauce first) and I make my own pesto with pine nuts, basil and garlic. It is delicious and great cold as leftovers with some avacado cut up in it!